The term Advent means arriving or coming. 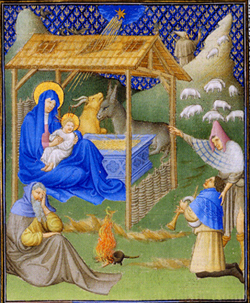 Advent as applied to the holy period of preparation for Christmas has three meanings, as illustrated by Dom Gueranger in his work, The Liturgical Year. Advent can be applied to Christ’s birth in Bethlehem, when Our Lord clothed Himself in weakness and humility for our sakes. It can also be applied to an interior coming of Christ, a loving and invisible one manifest through the grace of God in the Sacraments and the spiritual life. This interior coming of Jesus will continue until the last Advent of Christ on the dreaded day of the General Judgment. So then, while Advent normally is associated primarily as a time to prepare for the birth of Child Jesus in Bethlehem, the two other meanings can help us to better prepare for the joyful season of Christmas as well. 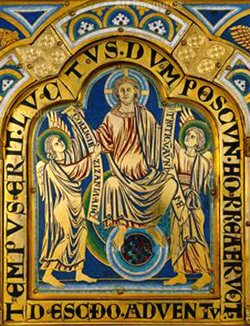 Just as there are these three comings of Christ, Dom Gueranger explains, so there are three classes of men, each of which can benefit by focusing on one particular Advent of Christ more so than the others. The first class of men is that of those few Catholics who are not just in the state of grace, but on the path of perfection. They truly love God and earnestly strive to please Him in all they do. They have both a deep yearning for the joys of Paradise as well as a profound fear of Hell. The Advent of Christ most helpful for them is the first one, the coming of Christ in Bethlehem. These souls are best prepared to contemplate the Manger and will derive great fruit from it. The fruit they seek is the increase of their union with God. To this end, books such as Bethlehem by Fr. William Faber can be helpful. The larger second class of men is that group who care not to grow in their love for God - their charity has become cold. Those persons, even when in the state of grace, abused the grace, became lukewarm and are living lives filled with venial sins. They would like to go to Heaven but are attached to earthly things. They want the best of both worlds and are in serious danger of losing God’s favor. They should consider the interior coming of Christ since they need to increase their love of God. These lukewarm souls need to consider the fruit and purpose of the first Advent: the life of grace leading to the Beatific Vision. I can recommend no better book for such an end than Dom Chautard's Soul of the Apostolate. Such meditation can help these tepid Catholics to become more grateful to God for that which they received through the Incarnation. They should ask God for gratitude as well as holy zeal in these meditations. Only then will the first meaning of Advent become more than mere sentiment and superficial joy for them. And yes, they should also take some time to reflect upon the third Advent of the Irate Judge who will hold them accountable for all of their actions to the last farthing. The third class of men includes those who are in sin and constitute the major group. They live without thinking on Heaven or Hell, or anything in-between that does not concern their day-to-day lives. This world appears to be their final goal. This class of men needs to learn the fundamental truth, “The fear of the Lord is the beginning of wisdom.” Taking time to focus on the third Advent of Christ is the most beneficial for this group to reach that aim. From this should proceed a true horror of sin, repentance and, after a good examination of conscience, Confession. Then they can move on to considering more closely the other two Advents of Our Lord. To know to which class of men you belong to, think about what the disposition of your soul might be if, let us imagine, St. Joseph invited you into the stable to adore the Child Jesus and pay homage to Our Lady. Perhaps your reaction is a profound sense of unworthiness and yet you still desire to enter and there is nowhere else you would rather be. Then you are probably among the first class of people. Or perhaps you wonder why you are not more enthused by this invitation and feel discomfort because you don’t know what to do or how to approach the Manger. Then you may be among the second class of men. If, however, you think that your reaction might be something like, "Get me out of here!" You are uncomfortable, afraid to have your soul exposed by such an encounter, then you are in the third. With a little bit of self-examination, it hopefully will not be too difficult to comprehend which class of men each one of us belongs to, provided that we are honest. 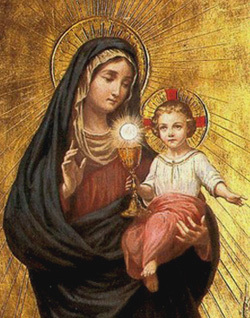 In any circumstance, one should not despair, but confide entirely in Our Lady, who is the Mother of Mercy. She will help us find the right path back to Christ. It is my hope that by the end of this Advent season, each one of us, no matter what class we belong to, will achieve some level of true peace of soul and be able to make room for the Divine Infant to find a place to rest His head this Christmas.